See the location of the Follaton Arboretum and Forest Garden here - it's behind Follaton House, the premises for South Hams District Council, less than a mile from the centre of Totnes, along the Plymouth Road. Come and join part or all of a monthly volunteer session to establish a forest garden within the Follaton Arboretum. We have planted trees, shrubs and perennial edibles and created a path leading to a sitting area with a fire pit for picnics. This spot enjoys great views towards Dartmoor. We will now continue improving this picnic area and the adjoining pond, plant more understorey shrubs, herbs and flowers, and care for the existing ones (weeding, mulching, pruning, etc.). We are also caring for the Edibles Nursery, near the forest garden site, where we propagate edible plants - especially fruit and nut trees and shrubs - for community gardens in the area. We run grafting workshops at least once a year. Our regular family-friendly sessions take place on the first Sunday of each month, 11 am to 1 pm, and all are welcome to help or just to give some verbal support! We learn gardening skills from each other and enjoy ourselves! Tools provided, and you can join for as little or as long as you wish. 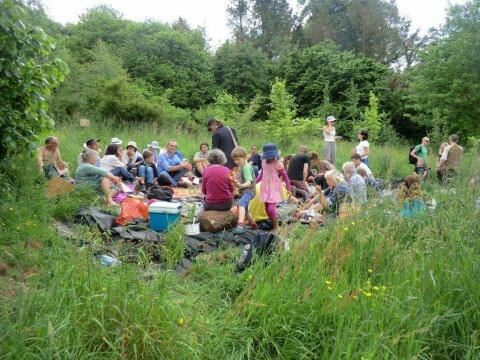 Weather permitting, we often stay on for a shared picnic beyond 1 pm. The forest garden is near the highest point of Follaton Arboretum, next to the gazebo (and the nursery is further down, on the North West side of the park). More info follatonforestgarden@gmail.com. On the day of a session you can also call Larch on 07726 195412. Scattered widely through the Follaton Arboretum are groves of nut trees planted as a transition initiative since 2007, and a fruit orchard with apple, pear and plum trees, planted in 2012. These groves of young fruit and nut trees stand among a few old and mature nut trees, as well as younger plantings of native trees established by the volunteers of Trees for Health. On the first Sunday of each quarter from 2pm-4pm we tend the Arboretum Orchard and Nut Groves or the fruit and nut trees at the nearby Follaton Town Cemetery. The sessions follow on from the regular morning sessions in the Forest garden, although you don't have to have attended the morning session to join us in the afternoon. 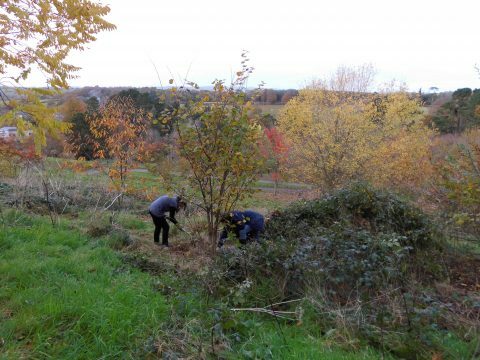 The session activities vary throughout the seasons and include summer and winter pruning, clearing round the trees, mulching and attending to the trees as needed. Everyone welcome. Meet at the gate leading up to the trees from Follaton Car Park. Please bring gardening gloves and secateurs if you have them (some spare ones will also be there). For more information contact incred@transitiontowntotnes.org. We are currently looking for someone to take on the coordination of this site. If you're interested, please contact incred@transitiontowntotnes.org or phone 01803 867358.